AUTHORITY was granted by Interstate Commerce Commission, Dec.7, 1921, to the New York Central, the Big Four and the Nickel Plate railroads, as applications, to purchase the corporate stock of The Cleveland Union Terminal Co., and to enter into an agreement with the terminal company for the use of the passenger station and its approaches to be constructed by it at the southwest corner of the Public Square at Cleveland, as shown in the Figs.1 and 2. This action reverses the opinion of the commission made public Aug. 12, in which an application was denied. (Engineering News-Record, Aug.18, p.297.). The commission also issued a certificate of public convenience and necessity with respect to constructing the station. It is believed that this action will now permit the Public Square station project to go forward, following the many years of discussion as to the location of a new station, during which the Public Square plan has been criticized in comparison with a union passenger terminal on the Lake Front. Plans and sections of the station as developed to date are here published for the first time. It is the intention of railroads and the Terminals Company to proceed with the financing so that construction may follow as quickly as practicable. Applications were made by the three railroad companies to the Interstate Commerce Commission on Feb. 14, 1921, and public hearings before the commission were held April 19 to 22, 1921. After the first applications are denied the railroads asked for rehearing, which was held, Sept. 20-27. As negotiations now stand, the new station will be used initially only by the New York Central, the Big Four and the Nickel Plate. The Pennsylvania has started it will not come into the station project and the other railroads, the Baltimore & Ohio, the Erie, and the Wheeling & Lake Erie, have not made a decision. Since the Pennsylvania now uses the present union station on the Lake Front, which is to be abounded under the Public Square Plan, it will probably make its principal passenger terminal at its present station located at East 55th St. and Euclid Ave. although present negotiations do not contemplate the immediate use of the station by the Pennsylvania, the Baltimore & Ohio, the Erie and the Wheeling & Lake Erie, it is maintained that the site will provide for traffic expansion of all the railroads for the next fifty years and that additional expansion can be obtained by the acquisition of adjacent properties. The three railroads now planning to use the Public Square station operate about 70 percent of the total number of steam railroad cars and receive about 70 per cent of the total ticket sales on all railroads entering Cleveland. It is also pointed out that track connections could be readily made to bring the Erie, the Pennsylvania, the B. & O. and the W. & L.E. into the new terminal. 1 -- That the new passenger facilities are imperatively needed by the New York Central Lines because of the growth of population of Cleveland and because the present station is old and inadequate: the station and approach tracks are insufficient in number: the station tracks are generally too short; the switching at the station is interfered with by other operations; the station is inconveniently located, being away from the business section of the city and from good street car service. 2 -- That the passenger traffic on the lakefront line interferes with freight operation and the service to industries and the freight operations slow down the passenger movements. 3 -- That the present lines of the New York Central through Cleveland along the lake front and around the southern part of the city are congested. 4 -- That additional tracks along the lakefront can only be obtained at very heavy cost because of the parks and industries, which hem in, the railroad on either said. 5 -- That additional tracks along the Cleveland Short Line can only at heavy cost because of tunnels, widening the viaduct over the Cuyahoga River, bridges over streets and adjacent parks. 6 -- That the lake front is an industrial section and should be kept free of passenger traffic so as to provide proper freight service for future industrial growth and for the rail and lake interchange when the city carries out its waterfront development. 7 -- That the passenger traffic should be removed from the lake front line to a new line so as to leave the present lines free for through freight and local and industrial traffic. 8 -- That there is not sufficient space on the lake front for future growth of the passenger terminal as well as increase of freight facilities required for growth for industrial business. 9 -- Which the Public Square station is the most convenient for the public, being near the business and office centers on the main streetcar lines. 10 -- That it is so situated as to be readily accessible for all the railroads. 11 -- That there is ample space for future growth of station facilities. 12 -- That the interurban and rapid transit lines will be in the same terminal with the steam lines and that they will develop the short haul business. Leaving the steam railroads free to handle the long business. 13 -- That the new route for passenger trains in connection with the Public Square station will solve the congestion difficulties of the New York Central Lines while the lake front plan will not do so. 14 -- That the complete Public Square project can be carried out more cheaply than any other known plan that will solve the congestion problem of the New York Central Lines. The engineering plans prepared jointly by the railroads and the terminals company call for but one track level -- 30 ft. below normal street level -- instead of segregating traction and steam railroad traffic on two levels as proposed in earlier studies. It is also the aim to distribute and segregate the traction and steam railroad passenger traffic by providing independent concourses and passageways, in so far as possible, and to segregate non-passengers passing through the station by providing separate accessible passageways. nine-track coach yard, later to be removed to outlying point,to occupy part of speace for thirteen additional steam line tracks for future expansion. 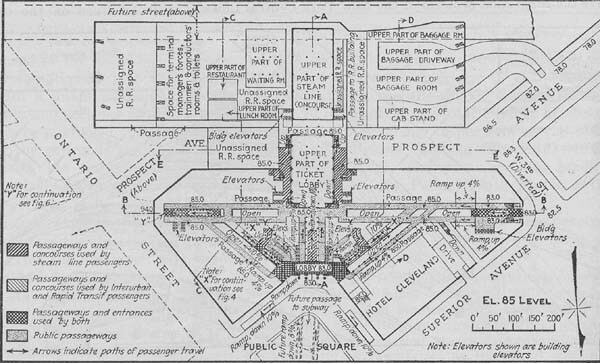 Since the adoption by popular vote of the city of Cleveland of the ordinance on Jan. 6, 1919, authorizing the construction of the Public Square Terminal, the original plans and the method of operation contemplated have undergone considerable revision. It is now planned to have initially nine station platform tracks for steam railroad lines on the level. A coach yard is also provided in the terminal, paralleling the platform tracks and occupying a space later to be used for expansion of steam railroad facilities o a total of twenty-three tracks. Plans for approaches and connections from the outer terminal limits are practically the same. Plans fir the stations itself have been made with a view to the greatest convenience would be caused by adding the station traffic to that already existing at the Public Square. For about twenty years new passenger station facilities have been the subject of controversy in Cleveland and the adoption of the Public Square plan by popular vote, Jan. 6, 1919, followed the previous adoption of a plan to locate a Union passenger terminal on the lake front. it was first proposed to build a stub-end, two-level station at the Public Square; then a two-level through station, and now plans developed by the railroads and the terminal company provide for a one-track-level through station. Since 1918 there has been a spirited controversy in Cleveland over the rival lake front Public Square project. A comparison of the two plans appeared in Engineering News Record, Jan 30, 1919, p.240, with editorial comment in the same issue criticizing the Public Square project. In answer to the criticism that congestion would be increased by a station at the Public Square, the railroads have contended that a large portion of their traffic now passes through the square since a large number of their passengers transfer there from station cars to main car lines, and that the steam railroad traffic is so small in comparison with that now using the square and is so distributed over the twenty-four hours that is addition would have little effect. Since interurban and rapid transit cars now terminating at the Public Square run at in infrequent intervals, the railroads point out that passengers collect in the square while waiting for trains, and that if these lines terminate in the proposed station, all this traffic will be removed from the street surface, and further, the interchange of passengers between these lines and the steam railroads will take place without the passengers going upon the street surface. It is also maintained by the railroads that the Public Square is an exceptionally large open space that can accommodate vastly greater traffic than it now more confusion than congestion at the square due to the return looping of all cars at this point and the operating of cars against the normal currents of traffic; that traction passengers travelling between the east and west sides of the city are forced to transfer in the Public Square or if they go only a shirt distance beyond the square have to leave the cars and continue their trip on foot; that in order to obtain a seat during the evening rush the people walk to the square to take the cars instead of taking them along the line; that the present difficulties at the square would largely be avoided by through routing of cars to points beyond the square; that the entrances and exits of the station are so located at points exterior to the Public square proper as to divert traffic away from the square only on of the five entrances being directly on the square; that a future subway under the square, which has been heretofore proposed by the city, and additional viaducts between the east and west sides of the city, as ate proposed, will remove much traffic from the square. 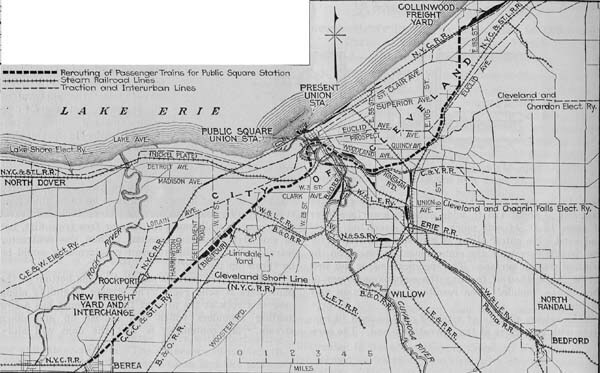 In answer to the criticism that the Public Square site would not afford opportunity for the necessary expansion of railroad facilities in the future, an analysis was presented to the Interstate Commerce Commission by the New York Central indicating that space is provided in the present plan for additional facilities to meet the requirements of all of the railroad entering Cleveland for the next fifty years at the present rate of passenger train increase of 1.33 per cent compounded annually, and that additional space is available for further expansion. It was not considered feasible by the railroads to locate the station adjacent to the east approach tracks east of the Public Square, since existing streets, large industrial plants, the Cuyahoga River, and other rail-road properties already developed, restrict the space necessary for expansion. 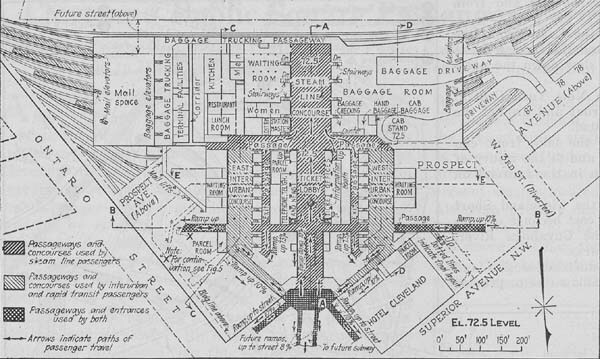 In reply to questions raised as to the economic soundness of monumental passenger terminals at the cost of dollars, it was stated by the railroads that the plans for the project as now worked out in details do not call for a monumental structure, but only for the railroad facilities above the street level will be commercial buildings from which revenue will be derived, with station entrances and exits through them. With the track level below the concourses and the development of extensive air rights over the terminal it self, electrification will be necessary. The probable limits of electrification and points of changing power will be at Collinwood on the east and at Linndale on the west. The rerouting of New York Central passenger trains from the lake front main line is shown in Fig. 1, and in this connection it is the present intention of the New York Central to route its west bound freight over the present lake front and east bound freight over the Cleveland Short Line, using the Nickel Plate eastbound track between Quincy Ave. and Superior Ave., jointly with that road. For the present, the principal construction work necessary for approaches, involving the use of the terminal only by the New York Central, the Nickel Plate and the Big Four, would be the grading, viaduct, bridges, and trackage on the on the west approach from about 25th St., over the Cuyahoga River valley into the station, and on the east the building of additional approach tracks with heavy grading and retaining walls, paralleling the Nickel Plate from the terminal limits and continuing into the station. Within the switching limits of the terminal, the plans call initially for four approach tracks for steam railroad traffic and two tracks outside if these limits. 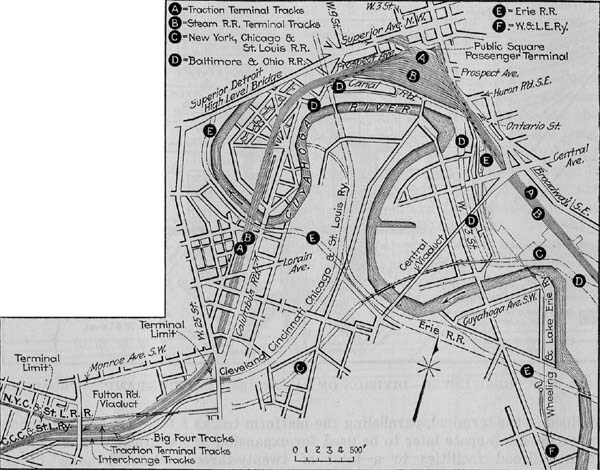 Calculations of the New York Central indicate that enough trackage has been provided at the throats and on the approaches, but it is stated that additional approach tracks for steam railroad traffic can be obtained by temporary or permanent use of traction line trackage if required on account of congestion, and by the construction of additional tracks if needed. Maximum grade on the approaches is 0.72 per cent, which is the ruling grade on the Big Four in this locality. Maximum curvature on the approaches of 4-deg. 40-min occurs on the curve just west of the terminal. As indicated in Fig. 3, ten steam railroad platform tracks are provided in the initial layout for a maximum peak traffic of twelve trains in the station during the busiest hour, and six trains in the station at one time. Of the three railroads using the station, eighty trains per day under present schedules would be handled. It is pointed out that ninety-eight trains per day are handled through the present lake front station on nine platform tracks, some of which are short. The three railroads consider the final tracks layout adequate for future expansion since it provides an increase of 130 per cent in the number of platform tracks, and if the number of trains continue to increase at the same rate as for the past eight years, namely, 1.33 per cent compounded annually, the layout would provide for a normal growth of sixty-three years. If all of the railroads entering Cleveland should use the terminal, there would be 152 trains per day on present schedules; 25 trains in the station during the busiest hour, and 9 trains in the station at any one time. In this case it is stated that the initial platform tracks will probably increased into twelve in number, and the final layout would provide for an increase of 90 per cent, sufficient for normal growth of traffic at the present rate for forty-mine years. The station area can be extended southerly in the future to provide further expansion of track facilities. Should it become necessary, it is contemplated the four of the traction platform tracks would be taken over for steam railroad purposes. It is proposed to lease to a company known as the Cleveland Terminal Co., those portions of the passenger terminal to be used for interurban and rapid transit platform tracks are proposed initially, and provision has been made for additional station tracks and platforms for this service. Tracks on the approaches for the interurban and rapid transit trains -- two initially and four finally -- will extend to the terminal limits, approximately two miles two miles from the center of the station, and beyond these points it is planned that trunks lines will be constructed from which branches will connect with suburban developments to relive the steam lines of this traffic. It is pointed out that the Shaker Heights rapid transit line, already in operation. Can readily be connected to the terminal, having been constructed with this in view. 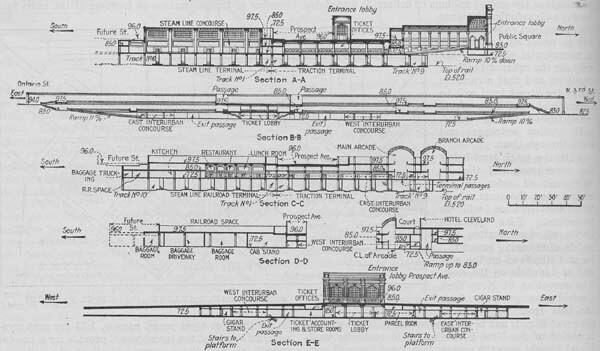 The principal consideration in the layout of the station, as developed in plans shown in Figs. 4, 5, 6, and 7, have been (1) to fit the floors in with different levels of streets; (2) to segregate steam railroad from traction passenger traffic, in so far as possible, and (3) to segregate non-passengers passing through the terminal from passengers. The concourse level -- El. 72.5 -- which is shown in Fig.4, is reached from the Public Square, Ontario St., and West Third St.(diverted) by ramps downward, and from Superior Ave. by a stairway from El. 83 to El. 72.5. A stairway is provided at the Ontario St. ramp from El. 96.0 to El.85, since the street elevation at this point is higher than at the other location above mentioned. Access to the concourse level from the Prospect Ave. entrance, El. 96, is gained by stairways on either side of the entrance lobby, connecting with short passages, and thence by other sets of stairways down to the ticket lobby, from which the steam railroad concourse is reached directly. Separate concourse for interurban and rapid transit station, connected by direct passageway with the Public Square entrance. The interurban and rapid transit concourses are also reached by joint passages from the Ontario St., the Superior Ave., and the West Third St. entrances. Track platform, El.52.75 (top of rail being at El. 52), are reached directly by stairways from the concourses at El. 72.5. Platform and stairways for steam railroad lines are provided between each pair of tracks and for the traction lines between each pair of tracks and for the traction lines between each two tracks. The location of mail and baggage elevators is indicated in Fig.4, which also shows the baggage trucking passageway around the rear of the station over the track and platforms in order to not to interfere with passenger traffic. Segregation of passenger traffic is indicated by the legend on Fig.4, 5, and 6, together with Fig.7, showing sections and elevations, indicate provision for non-passengers passing through the station(see legend, Figs. 5 and 6). Experience in the larger passenger terminals, notably the Grand Central Terminal in New York City, has demonstrated that a large number of people will inevitably pass through a terminal of this size, fronting on two or more streets and located in a busy part of a city. It was therefore considered important to segregate non-passenger pedestrians passing through the terminal from the passenger traffic. The principal passageway for this purpose will connect the West Third St. entrance at normal street level, El.83, with the Ontario Street entrance, a stairway at the east end to connect the Ontario St. entrance with the passageway at El. 97.5. a branch passageway is carried to Superior Ave. at normal street level, El.83, and two diagonal passageways as well as two shorter passageways alongside the entrance lobby, connecting the main passageway with the Public Square entrance at El. 83 are also provide. The main and diagonal passageways will be built in the form of double deck arcades with corridors on both levels on each side of a central opening over the terminal passageways as indicates by section C-C, Fig.7. single ramped passages will also connect the Public Square entrance with the main passageway at El.97.5, and branch passageways will be provided off the main passageway at this level. Along each pair of corridors, at El. 72.5, space for shops or other purposes will be leased. The Terminals Company has not yet made any plans for the construction of buildings south of Prospect Ave., and will only construct the necessary terminal facilities in this area. Columns and foundations, however, will be designed to carry buildings of possibly eleven stories in height above the street. These buildings would have direct connections into the passenger terminal where feasible. A direct connection by stairway and ramp will be provided between the existing Hotel Cleveland and the west traction passageway. In the area between Prospect Ave. and the Public Square and along Ontario St. east of Prospect Ave., buildings will probably be constructed about the same time the terminal structures are built. The building at the southwest corner of the square may be possibly be twenty storied above the street and the other somewhat lower. The areas above the terminal may be developed company or leased for the construction of buildings as has been done in the case of the areas over the Grand Central Terminal, New York City. The plans for the project have been worked out in collaboration between the three railroads, by George A. Harwood, assistant to the president, and H.D. Jouett, terminal engineer, New York Central Lines, and the Cleveland Union Terminals Co., represented by W.E. Pease, chief engineer of the Cleveland Union Terminals Co. 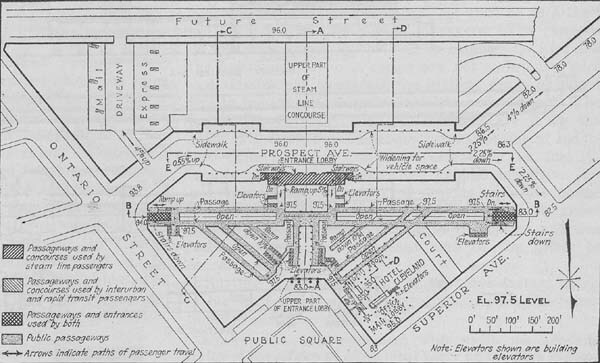 This electronic, World Wide Web edition of the "Cleveland Public Square Passenger Terminal Authorized" contains the complete text as found in the original Engineering News Record article from 1921. The site is hosted by the Cleveland State University Library. Thanks to CSU Engineering grad student Ravi Chand Suvarnakanti for digitizing this article.